KNOXVILLE, Tenn. – The third-ranked Tennessee Volunteers jumped out to a 20-6 lead and never looked back in a 106-87 victory over Arkansas Tuesday night at Thompson-Boling Arena. 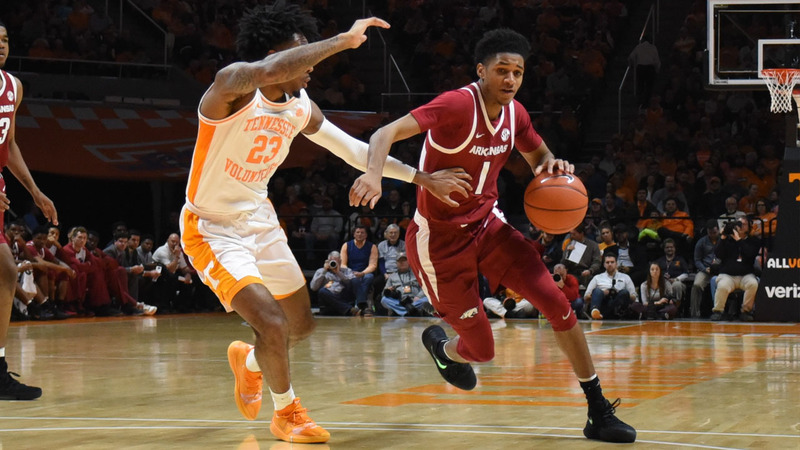 Despite the 19-point victory, the stats for both teams were fairly even across the board with the key difference coming from the free throw line as Tennessee was 35-of-39, compared to 13-of-22 for the Razorbacks. The Vols would stake a 55-34 lead at halftime while shooting 50 percent from the field and making 20-of-23 at the charity stripe. The Razorbacks only made three fewer field goals than Tennessee (12-to-15) in the first half but were just 6-of-11 at the free throw line. In the second half, Arkansas did not back down. The Razorbacks outscored the Vols, shot 57 percent from the field and out-rebounded Tennessee (16-13). However, the Vols were 15-of-16 at the line compared to the Razorbacks’ being 7-of-11. Grant Williams led the free throw barrage for Tennessee, going a perfect 14-of-14 and scoring 18 points. Lamonte Turner led Tennessee overall with 21 points off the bench while Jordan Bowden added 19 points off the bench. Admiral Scofield contributed 17 points – all in the second half – while Kyle Alexander had 12. Isaiah Joe led the Razorbacks with 23 points, making 7-of-13 from 3-point range. Mason Jones finished with 18 points, seven rebounds and six assists. Reggie Chaney (11) and Daniel Gafford (10) each finished in double figures as well. Arkansas will stay on the road to face #18 Ole Miss on Saturday (Jan. 19) with tip-off set for Noon on the SEC Network. Tennessee used a 17-1 run early in the game to take a 23-6 lead. Mason Jones ended the 3:02 drought with a 3-pointer. Tennessee later put together a 7-0 run to push its lead to 21, 42-21, with 4:52 left. Isaiah Joe led the Razorbacks in the first half with 111 points, making three, 3-pointers. SECOND HALF: Arkansas out-scored Tennessee 53-51. Tennessee led by as many as 30 (91-61) with 7:51 left in the game. Arkansas out-scored Tennessee 26-15 the rest of the game. Isaiah Joe led Arkansas with 12 second-half points while Mason Jones added 11. Arkansas had eight steals in the second half, compared to one in the first half. Arkansas’ starters were Isaiah Joe (G) – Jalen Harris (G) – Mason Jones (G) – Adrio Bailey (F) – Daniel Gafford (F). This has been the starting lineup in 15 of Arkansas’ 16 games. Tennessee controlled the tip. Tennessee’s Kyle Alexander scored the first points of the game, a layup at at 19:43. Adrio Bailey scored Arkansas’ first points on a free throw at 17:07. With the win, Tennessee now owns a 21-20 advantage in the all-time series and a 20-17 advantage in the series since Arkansas joined the SEC. Tonight’s game went against the norm. In the previous 36 games between Arkansas and Tennessee since the Razorbacks joined the SEC, the average margin over victory was just 8.6 points, including 13 times the game was decided by five points or less. Arkansas, now 10-6, lost by 19 versus Tennessee Tuesday. In Arkansas’ first five losses this year, the Razorbacks lost by a total of 19 points (3.8 average). Isaiah Joe snapped a two-game dry spell. He scored in double figures in each of the first 13 games, but only scored 11 combined points in his last two games (Florida and LSU). Not only did e score 23 points, he scored 11 in the first half alone. Tonight was the first time Arkansas had surrendered at least 100 points since falling at #2 Kentucky, 101-70, on Jan. 23 2010.